Your iPad can help you stay in touch with friends around the world. These instant messaging (IM) apps let you have text conversations on the go with more privacy than Twitter offers. Check them out. Who’da thunk that AOL would release a really good iPad app? This figure shows the main interface for AIM for iPad. On the left are active IMs; on the right is the Buddy List. In the middle is a conversation. You can view your Lifestream, which is all the status updates anyone on your Buddy List has made; grab Facebook status updates and Twitter updates; and send an IM out as an SMS text message to a cell phone via Wi-Fi or 3G. BeejiveIM is a premium product with reliable connections to all the major IM networks, low CPU overhead, and a good interface. It supports AIM and Apple’s iChat, MSN, Yahoo!, GoogleTalk, Facebook IM, ICQ, Jabber, and MySpace IM. It also features real-time chats, group chats, file transfers, SMS out, emoticons, push notifications, and more. It is, in short, a one-stop shop for all your Instant Messaging needs! 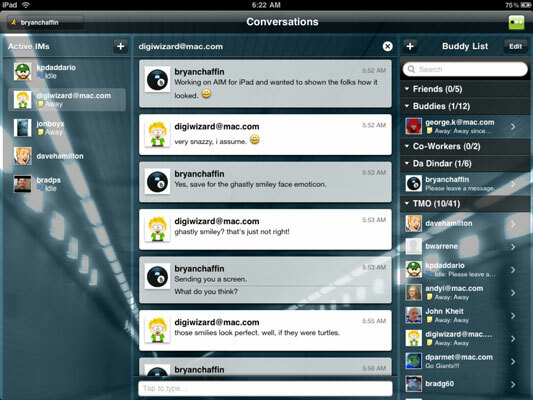 This app is for a service centered on bringing the world of chat rooms to mobile instant messaging. With this app, you can find existing chat rooms, create your own, or simply send SMS text messages from your iPad to an SMS-enabled mobile phone, or to other textPlus users. The interface is nice (it has some Apple iChat-like elements), and it’s easy to use.